Disasters happen, and first responders train to prepare for them. Responder agencies are often the local agencies responsible for outreach to their residents, and the type of agency can vary from location to location. Depending on your county, it may be the local Emergency Management Agency, Law Enforcement Agency, or Fire Department. Some communities place the responsibility with the regional emergency dispatch office. Many community residents in all regions follow all the preparedness guidelines: stock water and food, have your weather radio programmed, check your smoke detectors, and have a plan. But during the disaster, real time information is critical for keeping your residents safe, and your scene from becoming more chaotic. Facebook, Twitter, LinkedIn and other platforms are free to set up and use. This is a great way to notify your residents of regular events, such as regular siren testing, or getting weather radios programmed locally, and also for keeping them informed, in near real time, about where a funnel cloud has been seen, how the hurricane is moving, what they need to do. We have all experienced the sheer panic of hearing that our family member, friend or neighbor has been hit by a disaster. The first instinct is to go and help—but panicked bystanders or onlookers may hinder professionals' ability to respond and run the scene efficiently. A post saying, "Please stay indoors, we are on scene and doing a search in your neighborhood" may prevent persons from becoming additional victims requiring resources to treat. A post asking people to "evacuate to the local elementary school gymnasium" may also help you reach your residents, and calmly direct them to where they need to go. The scenarios where social media can be an effective tool are endless. I know you are asking, "How do we do this with our limited resources?" For the answer, I'd like to introduce Mr. James Payton from Huntsville, Alabama, who is a volunteer administrator, not on his local community EMA page, but on the pages of Pike, DeKalb, and Barbour Counties. Pike County is four hours away, but with his training and expertise in social media, he has helped these counties through disasters. "On Christmas Night (2012) two tornadoes struck Pike County. Jeanna was covering her duties of EMA...& asked me to keep the social media updated. One of the tornadoes reached EF-2 strength very late that night...& caused damage to a mobile home park. I was on Facebook providing updates every 3-4 minutes (from Huntsville) on the location of the tornado & who should take cover. I am happy to report not one single person in Pike County lost their lives that night." FEMA offers over 150 free online courses, many about an hour long, covering all kinds of situations. Whether your community has a risk of hurricanes, blizzards, or earthquakes, you can plan a training program for your volunteers. These courses lead to a certification. Tailor the marketing strategy for your community. Find those great local people who will tell everyone to "like" you on Facebook, "follow" you on Twitter, etc. Perhaps in your community it would be a Public Service Announcement in your paper. In others, it may be posting flyers at local businesses. You know your community best. There is no one right way to do it. Keeping your page updated with community information will ensure your residents continue to see and interact with your page. Too many posts however, and they are likely to start ignoring you. There is a definite balance, and each community is different. You may have to spend a little time perfecting the outreach in your area. "On the late afternoon of March 18 two tornadoes along with wind gusts in excess of 100 mph struck DeKalb County while the county was only under a severe thunderstorm watch. Once again I did the same thing as Pike County three months earlier & provided quick & accurate updates of the tornadoes...both also reaching EF-2 strength. 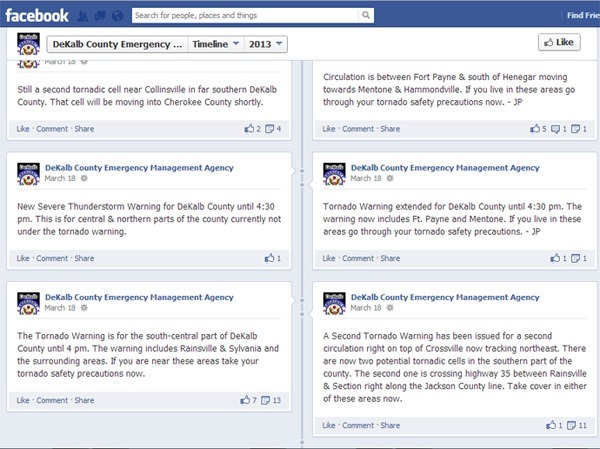 Once again nobody was killed in the tornadoes...but the final social media numbers during the tornadoes were staggering. During the height of the danger over 38,500 people read our updates that day...more than 50% of the population of the county. It was this event that drove home to everybody...that social media plays a HUGE impact on people's lives including safety. Social media is free, easy to update & can reach so many so quickly. Furthermore...during non-emergencies it's a great way to pass on preparedness information, weather facts, public service announcements such as 'be ready' day & other county events, news, & other events such as siren testing reminders. Also...it allows people in the county to get interactive & feel like they are part of the team. For example...Doing a siren test & asking people which siren do they live near & if they heard them go off...or having them post damage reports."